Is that your drawing or mine? Can you learn to draw from an AI teacher? 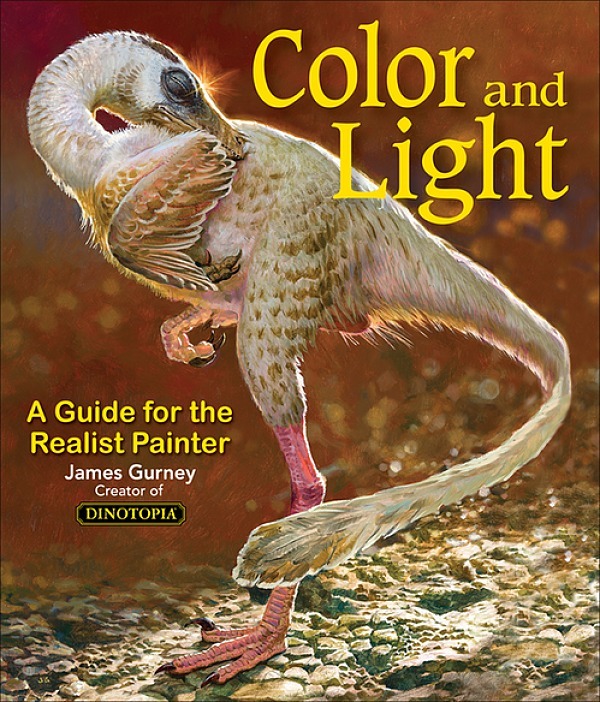 Plein-air gear for controlling light. 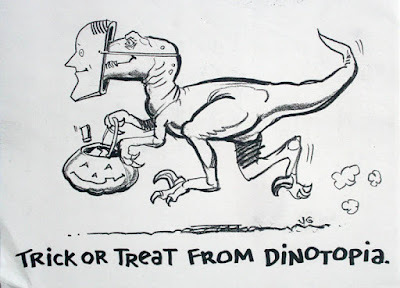 Hope you have a fun spooky holiday. Here's a vintage reading of a 1952 essay by Austin Briggs about the profession of illustration, from The Famous Artists Course. This recording comes from a cassette tape which circulated among a group of friends in 1986. Please excuse the poor audio quality from this old cassette tape, as well as the male-only language of Mr. Briggs. 1. 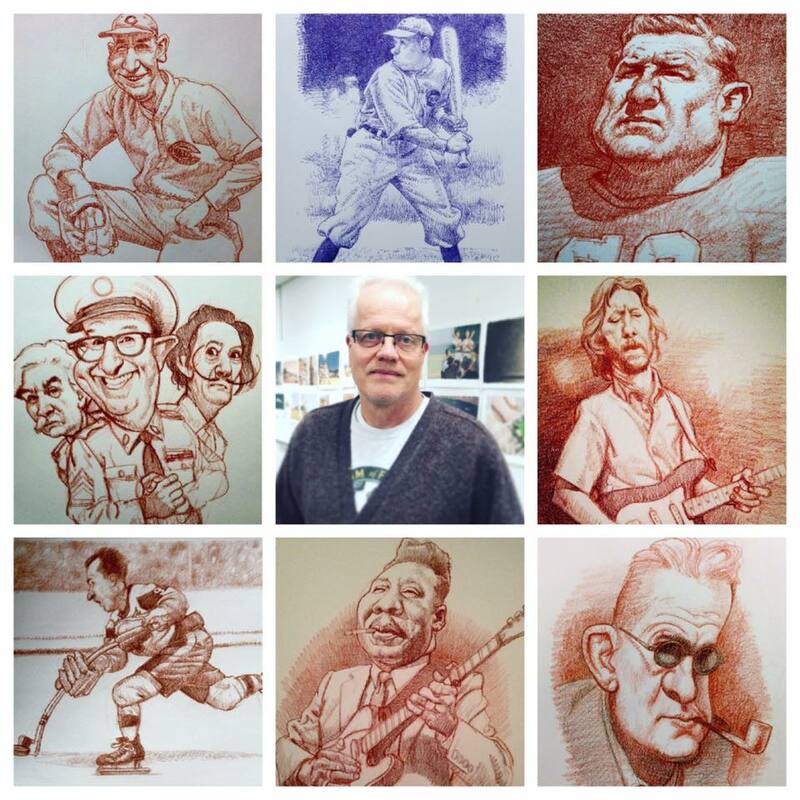 What it takes to be a success as an illustrator. 2. Why fun is important in illustration. 3. Avoiding formulas and injecting novelty. 4. How to improve your technical abilities. 5. Having something personal to say. 6. Developing an original approach. 7. 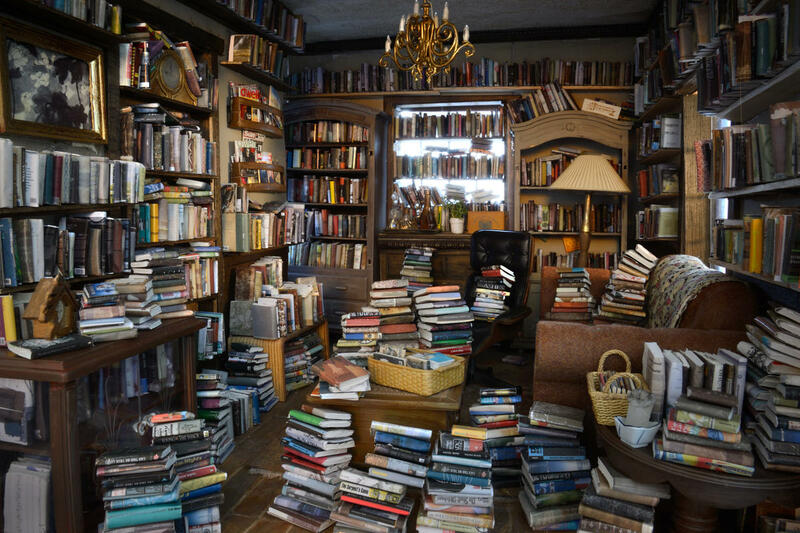 Where to get inspiration. 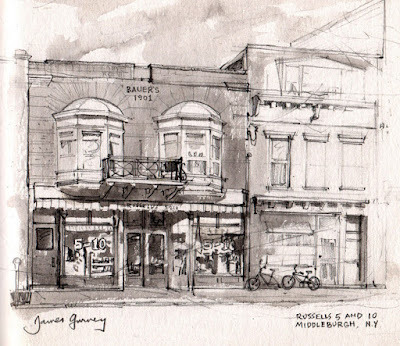 I chose pencil and gray wash for drawing these storefronts in New York state. The perspective is slightly off-angle, with remote vanishing point for the facades far to the right. To keep all those gently sloping lines in relationship to each other, I drew a grid of preliminary guidelines, starting with the eye level (which runs through the middle of the shop windows). The other key foundational line is the line at the top of the building. You can still see that light guideline near the top of the cornice of the Bauer building. The intermediate lines of the facade are interpolated between those two lines. 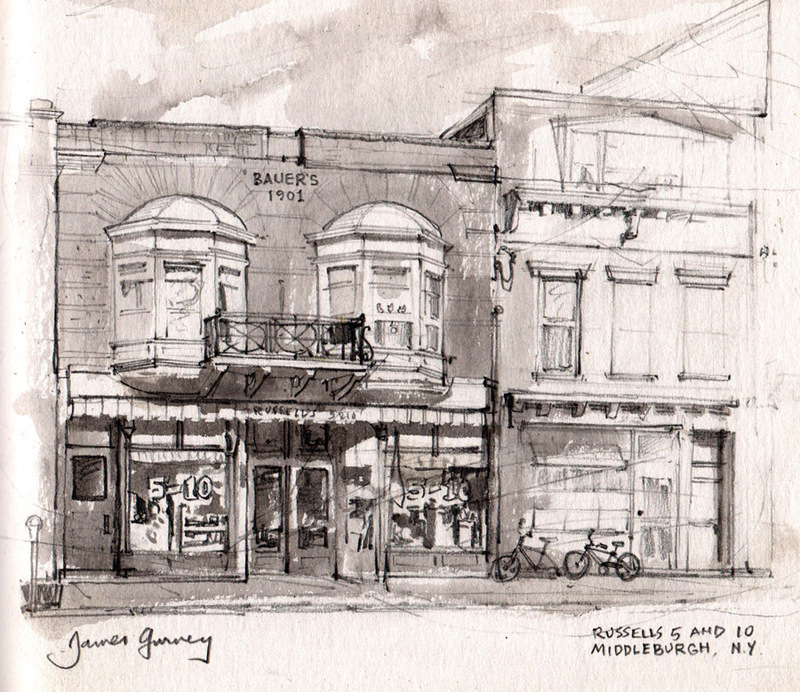 When composing a picture with a storefront or any architecture, one choice that you have to make early on is whether to paint it straight-on in one point perspective (where all the horizontals of the facade stay horizontal), or whether to introduce some convergence. As artificial intelligence becomes more and more part of the workings of our portable devices, app designers will be able to harness the phone's potential for face, speech, and object recognition, plus designers will be able to use the phone's tools to create all sorts of augmented realities. With hints of what may lie farther down the road, technologists are getting closer to developing a more nuanced brain-machine-interface, which is both fascinating and scary in its implications. The Wired article linked above describes the potential of the interface as being "a gateway to a new symbiosis between humans and objects." People could not only incorporate devices into their bodies to enhance their own thought processes, but also add on biological appendages, like extra eyes, fingers, limbs, or a tail. Then you would need some sort of digital interface for the necessary motor and sensory support. It's fascinating and creepy stuff to read, which makes me appreciate even more the un-enhanced human 'software' and 'hardware' we were endowed with. As someone said in the article, "The hand is the mouthpiece of the mind." 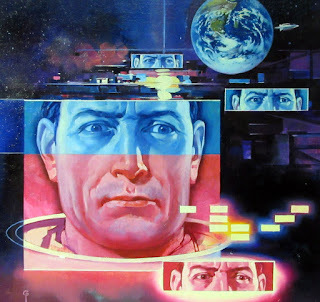 I expect that a counter trend of digital refuseniks will continue to emerge, and we'll see an "Agency Movement" of people consciously choosing to be the agent of their own existence, opting for practical intelligence over the allure of the digitally enhanced life. Morning at the diner, time for a quick sketch before the breakfast arrives. V.H. asks: "Dear Gurney, I have a question to ask you. 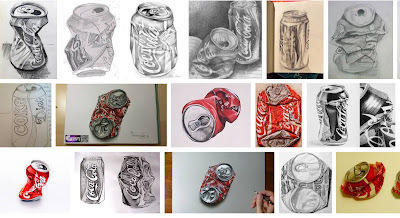 It is about your Coke can post from 2013. 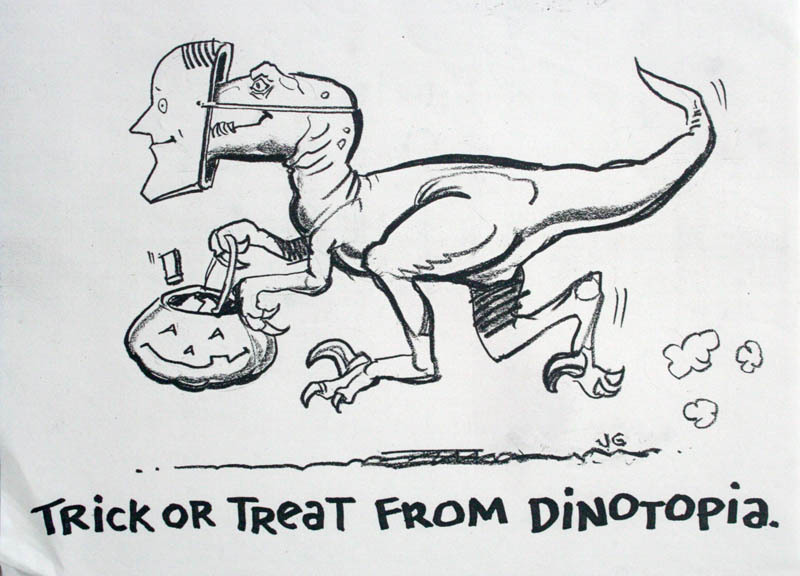 It is a funny post, but I was wondering if you made this drawing yourself. It looks so much like a drawing I made back in high school. I can see that a name is chopped of in the right corner. According to your blog, it also does not seem to be your style." —V.H. Dear V.H. Yes, the drawing is by me. 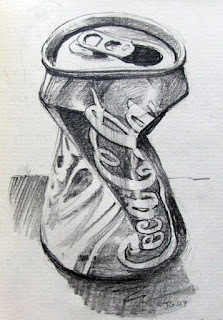 I drew it in a beer garden in Ireland in 2004. If you look closely, you'll see "JG 04" in the shaded section at the lower right. I can't say whether the drawing is my style or not, as I don't think much about style. I wasn't looking at other Coke can drawings when I drew it, but now I can see from a quick Google search that my drawing is not the only drawing of a crushed Coke can. Other artists may have drawn the same subject before me, and others will do it after me. Some will do it better than me. But the important thing is that each of us encounters our own world for ourselves with our own eyes. 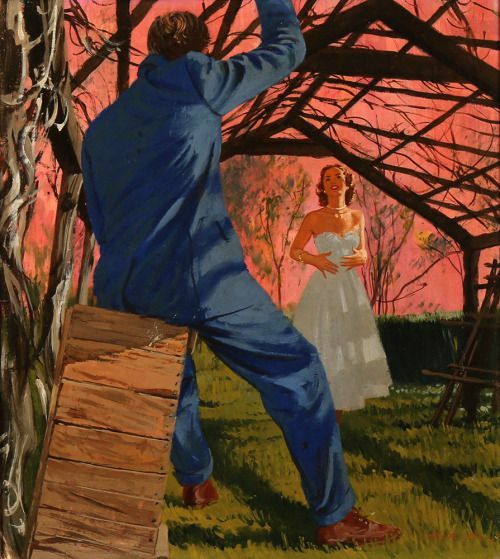 Artists have compassionately portrayed the challenges that wives sometimes face when things go wrong for their husbands. In Sergei Grigorev's Soviet-era painting, the man of the house has returned home. He set his hat and a couple of gifts on his daughter's toy table, hardly noticing the little teacups at his feet. He slumps forward, looking inward, clutching a cigarette and cradling a leather satchel in his lap. There's a picture of the smiling young wife on the wall, but an empty space where her husband's picture had been. 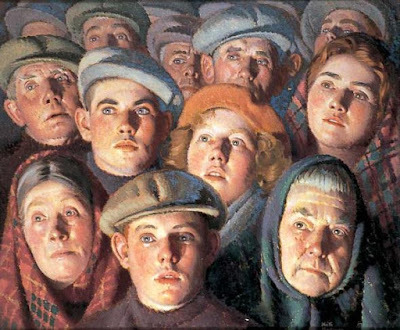 Evidently he is educated and relatively prosperous, but perhaps he is in political trouble or he has just returned from the Stalin-era labor camps (Khrushchev had just come into power when this painting was finished). 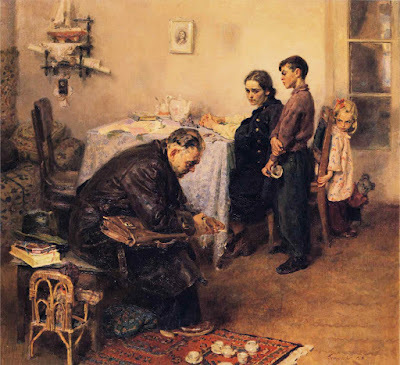 Far from being elated or surprised to see him, as in Repin's They Did Not Expect Him, each member of his family looks upset. The wife seems resigned, the son conflicted, and the daughter fearful. Makovsky portrays a young couple on a park bench, but it's not a holiday. It is bitter cold. The wife bundles her baby, and has a cloth-wrapped parcel on the bench beside her. She looks down in worry. 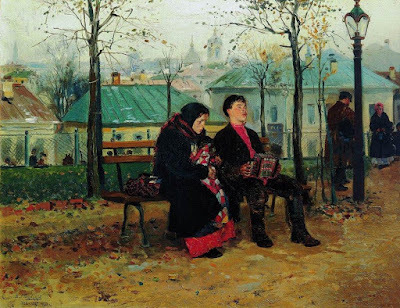 Her husband plays his accordion, oblivious to her and their apparent homelessness. 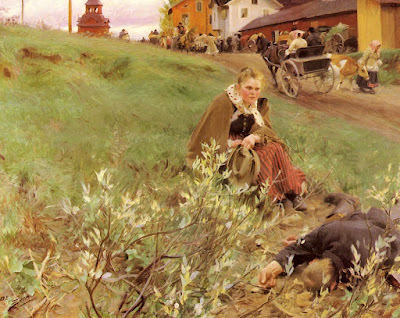 The plight of the wife in Zorn's painting is even worse, for her husband is passed out drunk after the fair. No one is stopping to help. She loyally holds his hat and waits for darkness to envelop them. 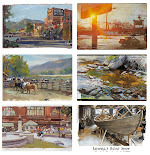 Each of these paintings speaks to the power of painting to tell gripping human stories on a par with the novelist's art. The difference is that in a novel there is an ending, but in a painting, the outcome will forever be unknown. 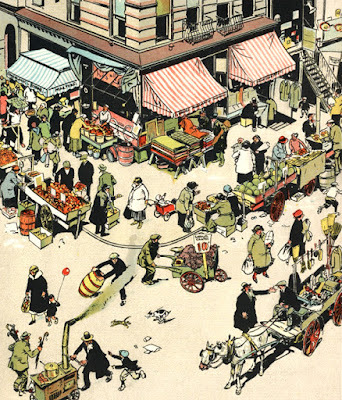 This drawing by Tony Sarg (1880-1942) is crammed with detail, but it's very well organized, which makes it easy to look at. 1. Simplify the tone of the ground plane. 2. Limit the palette, repeat a limited range of colors. 3. Use simple, clear silhouettes. 4. Make the perspective simple and accurate. 5. Use simple, frontal lighting. 6. Anchor the forms to the ground or delete the shadows. 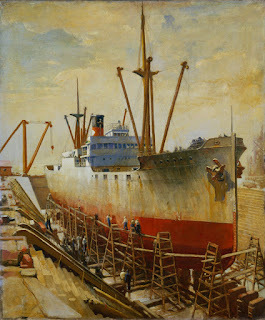 Thomas C. Skinner (American, 1888-1945) painted the worker's world of shipbuilding. 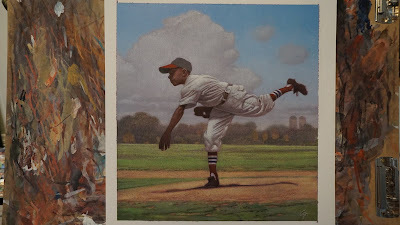 A couple of weeks ago, when I visited the Mariners' Museum in Newport News, Virginia, Jeanne Willoz-Egnor, Director of Collections Management, took me behind the scenes to see some of Skinner's paintings. 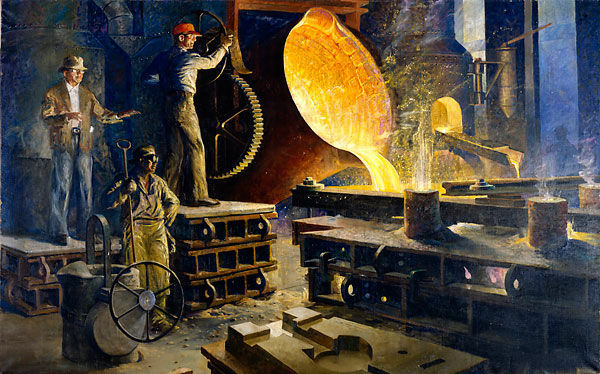 This giant oil shows the workings of the forge hammer shop. According to the Richmond Times Dispatch, December 19, 1948: "Shortly after the Mariners’ Museum was founded in 1930, Mr. Skinner was appointed its staff artist. 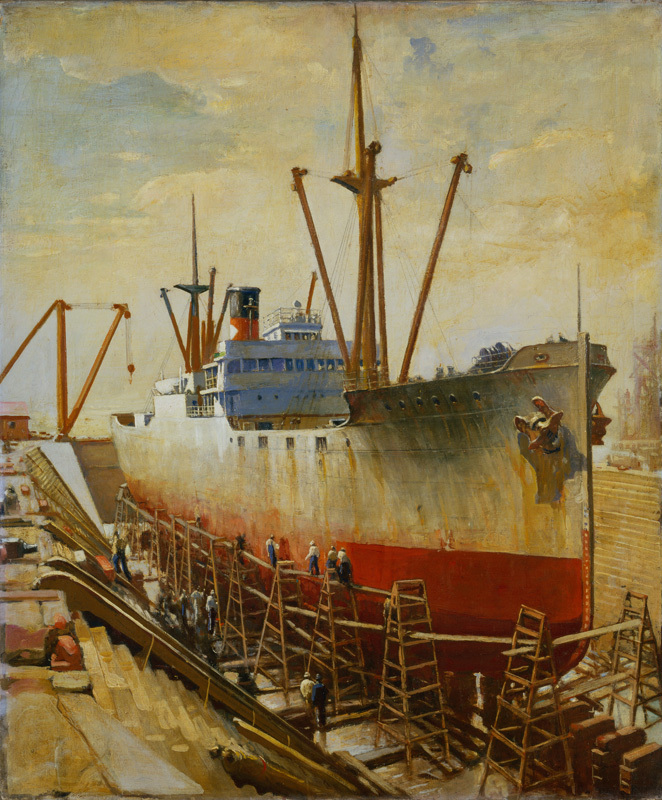 By a happy stroke of fortune he was assigned studio space in the heart of the shipyard where he could paint from life all phases of modern steel shipbuilding." 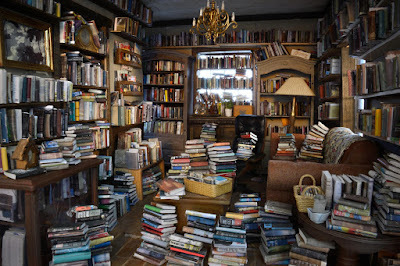 "His studio did not possess the conventional quite decorum. Riveting hammers provided a continuous tattoo, and his floor shook with the vibration of heavy machinery." "But he learned in a matter of moments to set up his easel and start sketching a damaged tanker being warped into a big drydock. The result has been that his unposed paintings are bold, colorful, and almost noisily true to life." 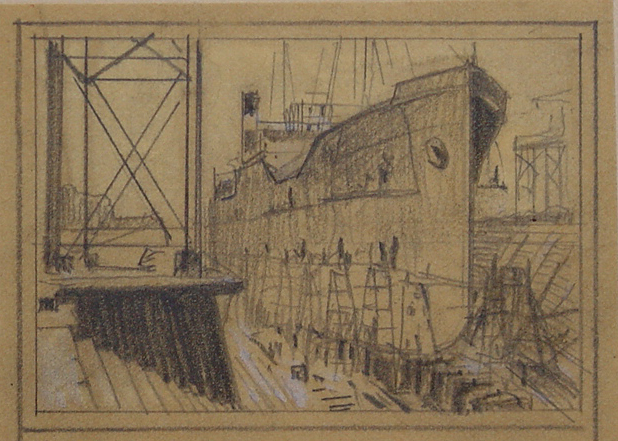 This 1933 gouache shows the Mallory Line freighter Mallemak in dry dock, getting a paint job. 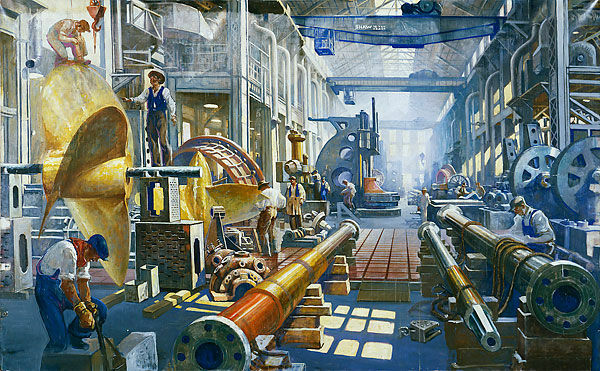 In the shipyard's heavy machine shop, he depicts the special tools used to refine the shapes of the forgings and castings. The expressed intent of his project was "to promote prosperity during the Great Depression and celebrate America's industrial might." 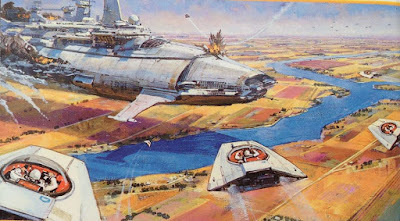 This scene was on the back cover of David Drake's paperback collection of military science fiction short stories called "The Fleet Book One ." To make the typical '80s air battle look more incongruous, I imagined it taking place at a low altitude over farmland. I set up the scale by introducing the fighter craft in the foreground, and then repeating them way back in the scene. I also softened the colors and compressed the lines of the croplands as they went back to the horizon. When I was in art school, many of the teachers spoke dogmatically about the importance of making the painting reinforce the flatness of the picture plane. But that idea never really interested me very much. The flatness of the picture plane is a given. 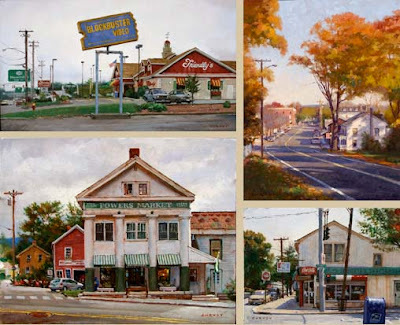 It's easy to make a painting look 2D—colored stuff on a rectangle of canvas. The real fun for me starts when the surface starts to fall away and pulls me back into infinite depths. Modern art theory: "The Importance of Flatness"
The clips include color video of some of the faculty of 1950s American illustrators, along with Walt Reed, who was one of the faculty helpers, and Elwood Smith and Howard Cruz, who took the course. Their exhibit "Learning from the Masters" will be on view through November 19. 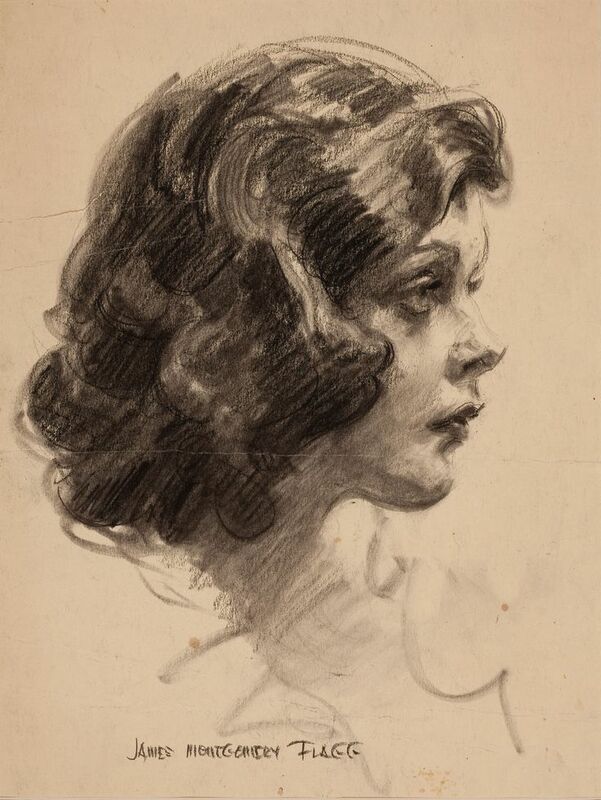 You can still get secondhand copies of the Famous Artists Course . 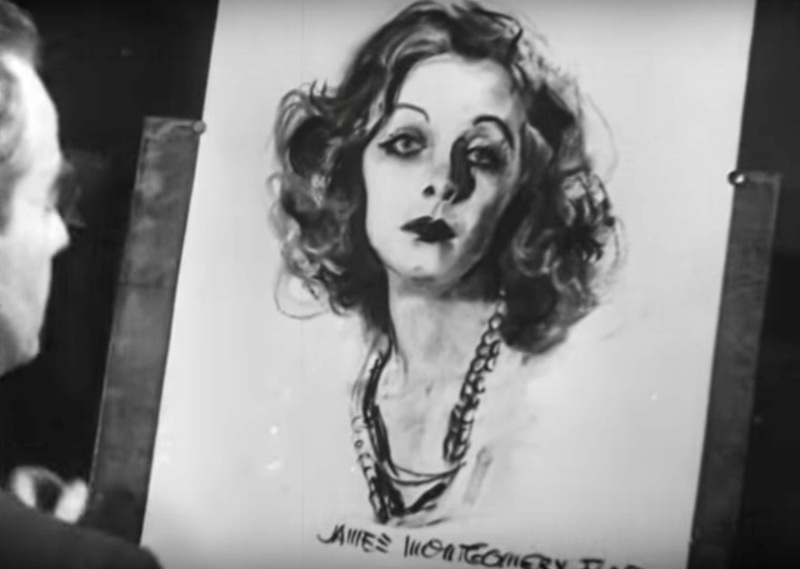 In this 1934 video, James Montgomery Flagg (1877-1960) draws a female model while talking about the importance of perceiving the skull underneath. (Link to YouTube). 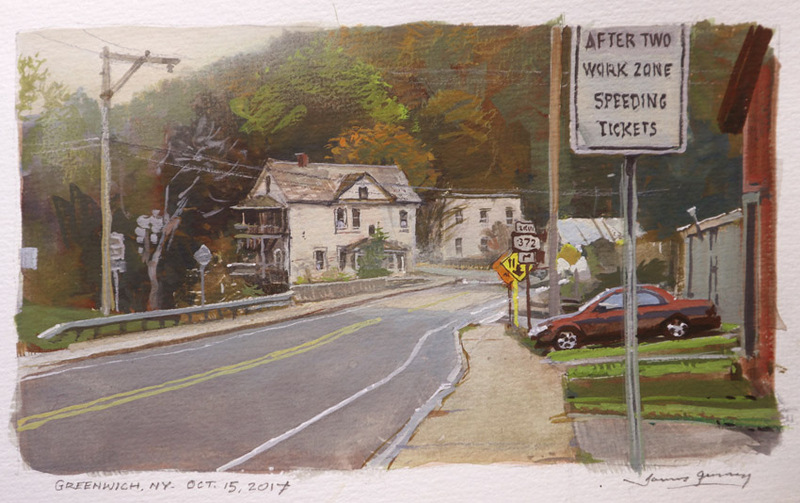 In the video he lays down a few preliminary structural lines, and then at 2:04, the video makes a jump to a nearly finished drawing. Flagg dramatically signs the drawing, turns to the camera, and as he puffs on a cigarette, he says: "If you're searching for a beauty, and you want her to last, pick yourself a good skull." 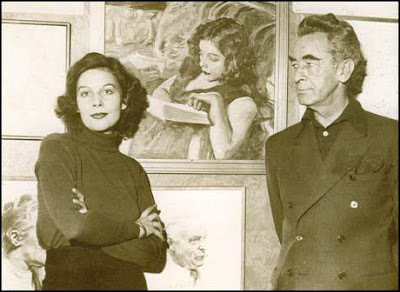 Flagg was a star illustrator from 1900 through World War I (for which he designed the famous 'I Want You' poster) and on beyond WWII. He was known for his lightning portrait sketches, but he also had a reputation for being cantankerous. His model is Ilse Hoffmann, whom he describes as the 'wood-nymph or elfin' type, but not the 'classic' type. 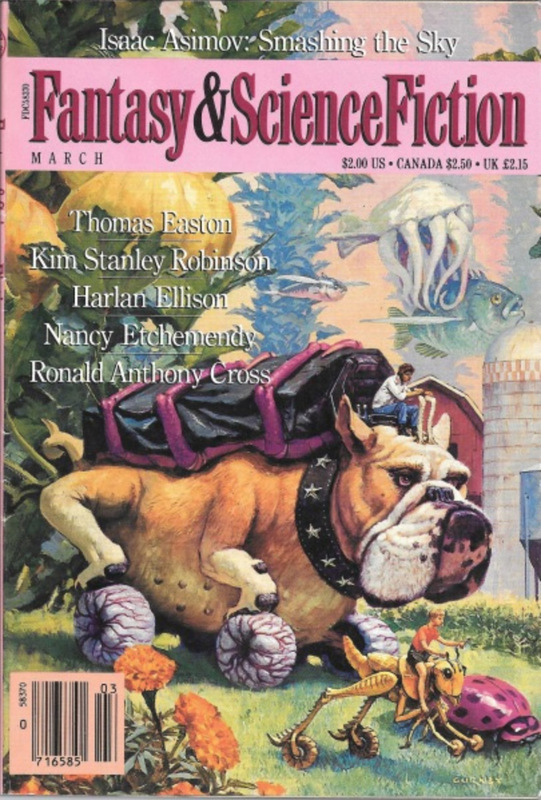 More about Ms. Hoffman in the comments of this post (thanks, everybody). The source that I used for the initial draft of this post was in error about her. 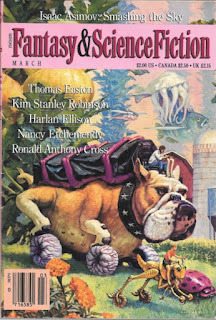 I painted this image for Thomas Easton’s science-fiction story “Down on the Truck Farm” (1990). 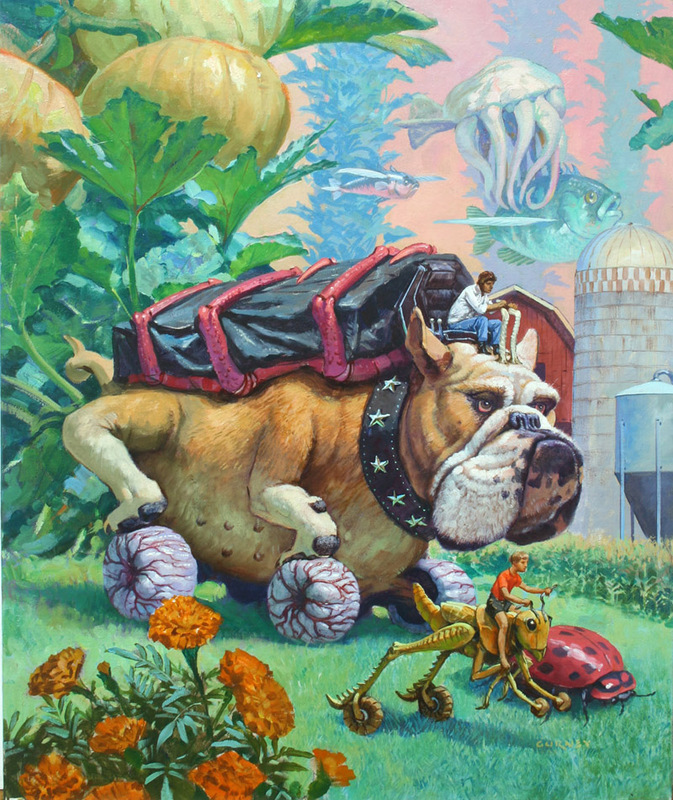 "The genimal's legs were mounted high, above the wheels, their joints reversed; as they ran, they pushed against the tires, spun the wheels on their bony hubs, and propelled the vehicle down the grassy greenways that had replaced paved roads early in the Biological Revolutions." To paint the setting of giant marigolds and pumpkin plants, I set up my easel outside in the garden. A few days ago I visited the old mill town of Greenwich, New York and painted this streetscape. In the video (link to YouTube), I share some tips for getting accuracy using the traditional pencil-measure method. Carrie Becker is a photographer and a sculptor of miniatures who produces exquisitely detailed interior scenes. 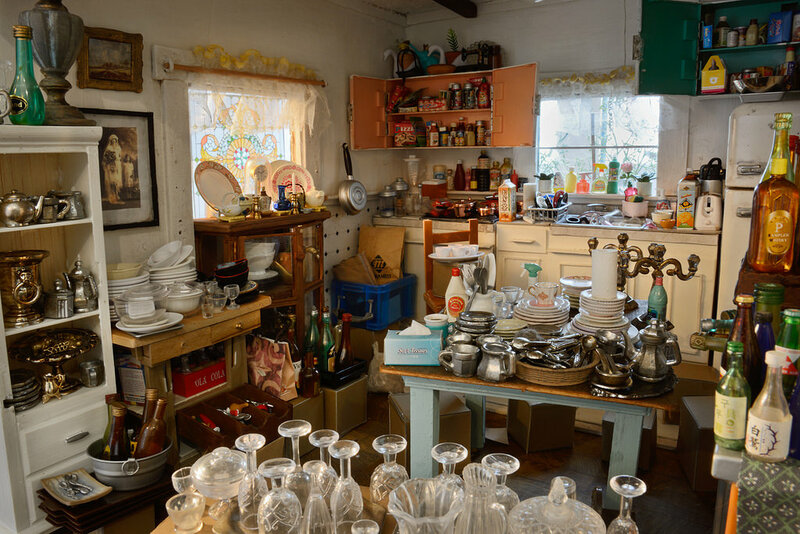 In "Barbie Trashes Her Dreamhouse," she presents rooms of a hoarder's home stuffed to the gills with clutter. 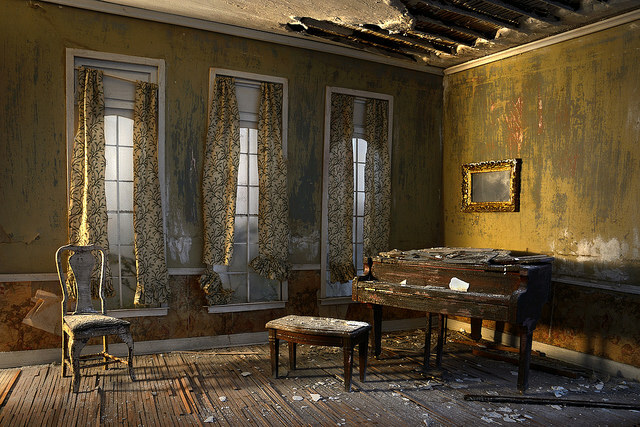 After completing a masters program in sculpture, Becker traveled through rural Kansas, exploring and photographing the interiors of abandoned houses. She used this inspiration as she outfitted each tiny room, implying the backstory to her imagined alternate reality. 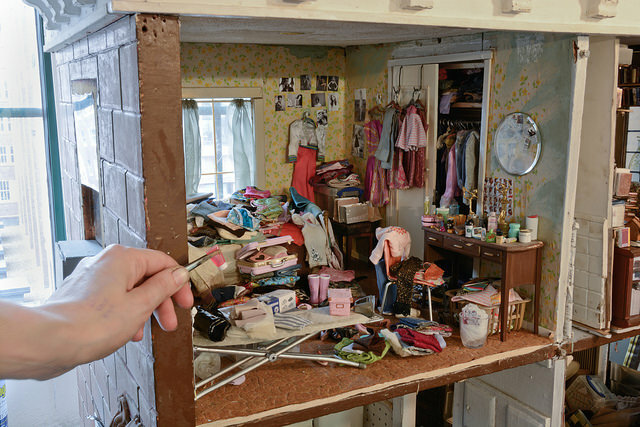 After the viral success of her Barbie-themed project, she worked on a theme called "Lilliputian Entropy," showing European-style rooms fallen into disrepair. American illustrator and teacher C.F. Payne is the feature of a new hour-long documentary called "C.F. Payne: An American Illustrator." 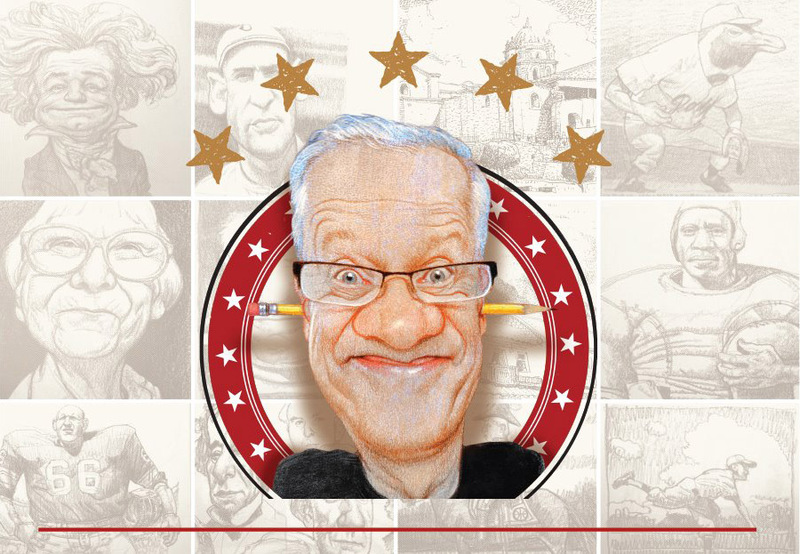 Payne is known for his award-winning Time covers, MAD magazine caricatures, and children's book illustrations, which he has produced over a span of nearly four decades. "It's not a race. It's a marathon. You just keep working." 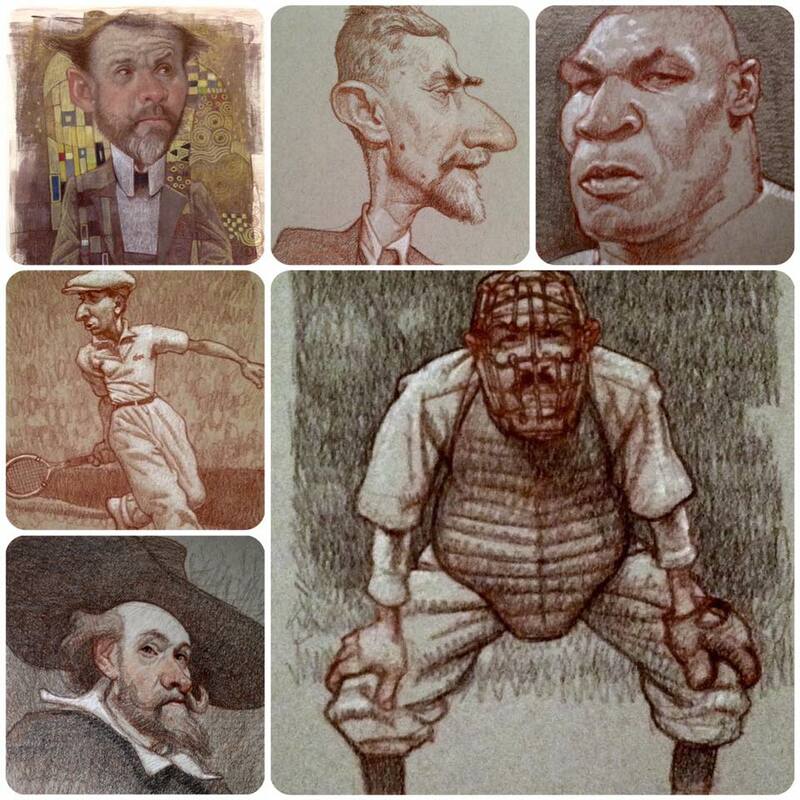 His whimsical and affectionate portraits of celebrities and sports stars usually start with sketchy drawings. Many of his editorial assignments have to be completed under extremely short deadlines. In the documentary he talks about the pressures of a freelance lifestyle, and we also get the benefit of hearing the perspective of his wife and two sons. One of the themes that runs through the documentary is Payne's love of baseball. 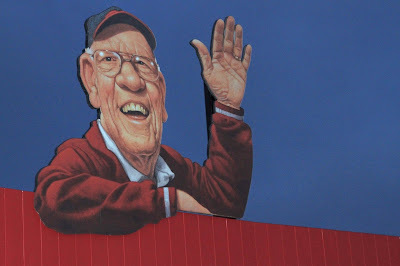 He paints a giant cutout of legendary player and commentator Joe Nuxhall to decorate the stadium of the The Joe Nuxhall Miracle League Fields. 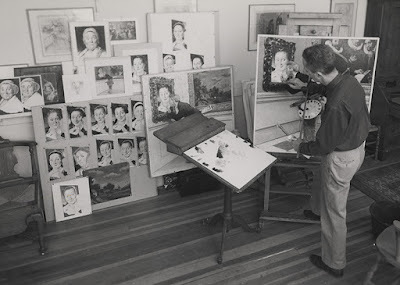 The film lets us see over his shoulder as he produces some of his multi-media paintings. But this isn't a technique video, and we don't really get the details of his materials or working process, nor does he explain his specific approach to caricature. However, if you buy the bundled version, you get a couple of demo videos along with the main feature. In those demos, C.F. 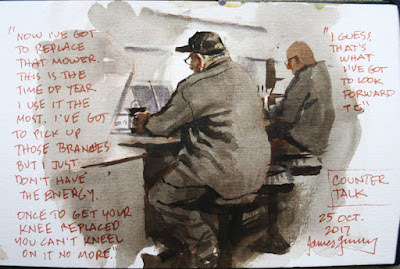 Payne goes in detail about his process. C.F. 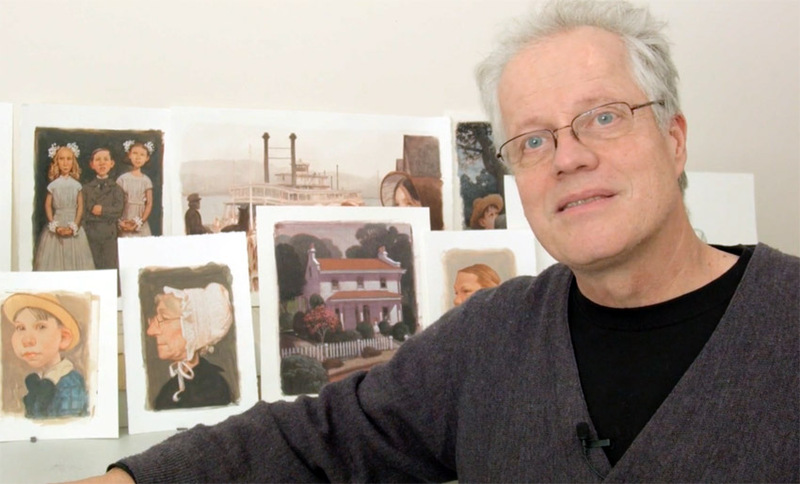 Payne: An American Illustrator is a portrait of a regular, hard-working guy, a good video to share with a young person who might be contemplating a career as an illustrator. Payne is committed to drawing every day and always improving his ability. 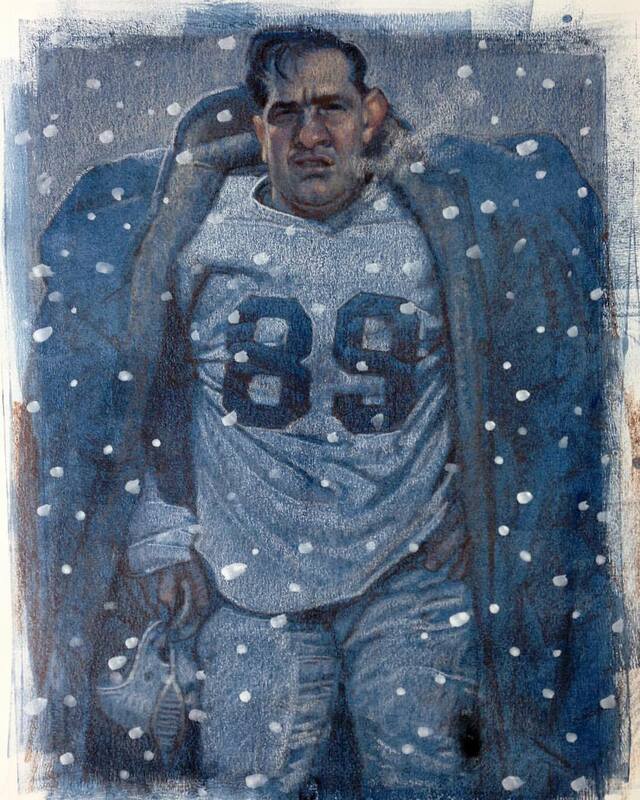 "I drew all the time as a young person," he says. "I love making art. It's the place I love to be." Teaser for "C.F. 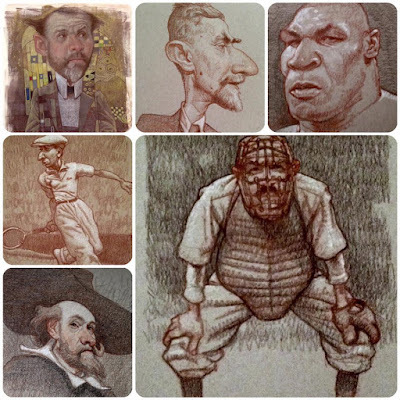 Payne: An American Illustrator" from Tony Moorman on Vimeo. 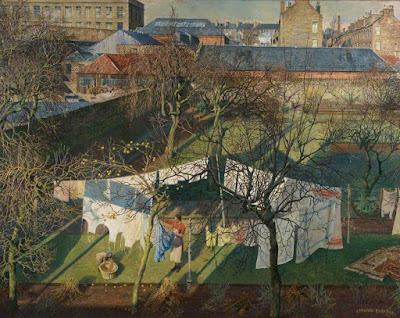 The National Galleries of Scotland are currently hosting an exhibit called True to Life: British Realist Painting in the 1920s and 1930s. 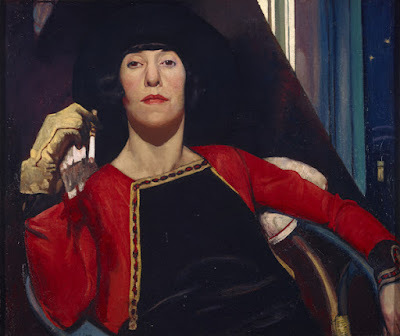 For a long time, realism from the early 20th century was overshadowed by the fashion for abstract and pop art, but recently it has undergone a revival, driven by an enthusiastic public and a group of dynamic curators. © The artist's estate / Bridgeman Images. 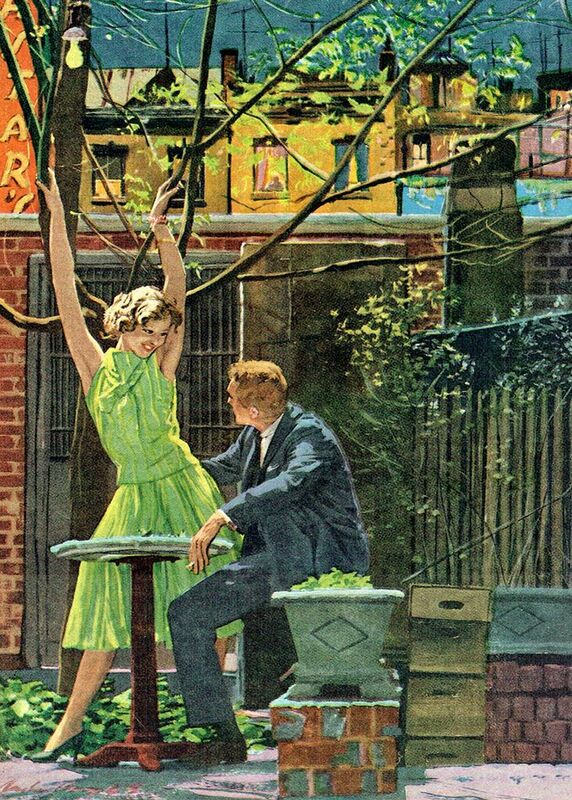 "...precise, hard-edged and graphic, and with minimal narrative detail, as opposed to loose and painterly. The Germans call it Neue Sachlichkeit [New Objectivity], and the Americans call it Magic Realism. 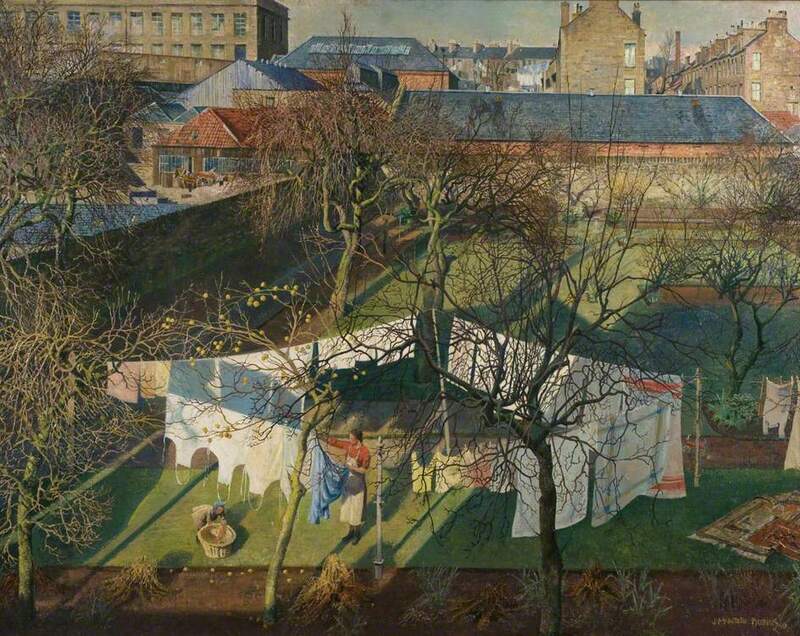 British art of this sort doesn’t have a name, which is maybe one reason why it doesn’t win much attention. Art history tends to award points, as it were, to artists who introduce change. So the first artists to go abstract, or use film, or go minimalist, are viewed as important." Many of the artists lived through the warring madness of the early 20th century. They used their realist training to offer moving statements about their times and about the universal truths of the human condition. Why War? 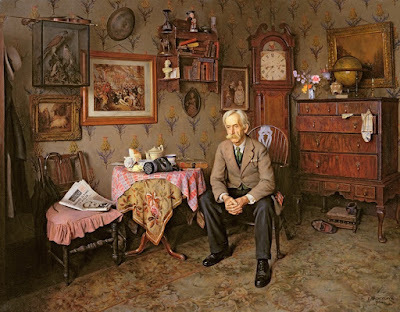 by Charles Spencelayh, 1938, oil on canvas, 94 x 115 cm. Spencelayh's painting "Why War" shows an older man in his sitting room, with its souvenirs of previous conflicts, including a gas mask and helmet from World War I, the "war to end all wars." The headline on the newspaper says "Premier Flying to Hitler." His books, tea, and violin bring scant comfort to the ominous prospects of the coming conflagration. The curators say that an exhibit like this would have been hard to put together before the days of the internet because the works were sold through galleries, and the trail of custody was not well known. But thanks to the website ArtUK, which documents all the paintings in public collections in Great Britain, it has become possible to know where they ended up. Thanks, Sue Arnold, for telling me about it.